(AP) GAZA CITY, Gaza Strip - Gaza's Hamas rulers said Wednesday they would stay on the sidelines if war breaks out between Israel and Iran, easing a key Israeli concern and distancing the Islamic militants from their sponsors in Tehran. The comments by Hamas spokesman Fawzi Barhoum coincided with speculation that Israel might strike Iran to prevent it from obtaining nuclear weapons. Such concerns were heightened by Israeli Prime Minister Benjamin Netanyahu's tough rhetoric on Iran during his high-profile visit to Washington this week. Israel believes Iran is trying to produce nuclear weapons, while Iran insists its nuclear program is for peaceful purposes. President Barack Obama told Netanyahu at the White House that diplomacy and sanctions must be given more time, but he did rule out military action if necessary to protect U.S. interests. Israeli military officials have said that in the event of Israel-Iran hostilities, Tehran's proxies on Israel's borders - Hamas in the Gaza Strip and Hezbollah in Lebanon - could open fire at Israel. Israel's military intelligence chief has warned that Israel's enemies have about 200,000 rockets and missiles that could strike all parts of the country. Asked about a possible Hamas attack on Israel, Barhoum said the Hamas arsenal is limited. "Hamas weapons and the weapons of the Palestinian resistance, in general, are humble weapons that aim to defend and not to attack, and they are to defend the Palestinian people," he told The Associated Press. "That does not give us the ability to be part of any regional war." In defense of Hamas' patron, he added, "The world shouldn't stand idly by concerning the Zionists' intention to attack Iran. This war is a danger to world peace." Hamas has a long history of attacks on Israel, including suicide bombings and thousands of rockets and mortars fired from the Gaza Strip over the past decade. Hamas continues to smuggle weapons, including longer-range missiles, into Gaza through tunnels under its southern border with Egypt. In its 24-year existence, Hamas has also stayed out of other conflicts, saying its sole purpose is to shake off Israel's occupation of Palestinian lands. Hamas does not accept Israel's existence. In recent months, Hamas has distanced itself from longtime allies Iran and Syria, mainly over Syrian President Bashar Assad's brutal crackdown on regime opponents. Iran repeatedly urged the Hamas leadership in exile, based in the Syrian capital of Damascus, to side publicly with Assad. Hamas refused, and its top leaders have left Damascus in recent months, seeking refuge in Qatar, Egypt, Turkey and other countries in the region. At the same time, Hamas has been careful not to cut ties with Iran, since it still relies on financial support from Tehran. Hamas needs those funds to help maintain its government in the Gaza Strip, a territory it seized by force in 2007. Hamas has largely observed an informal truce with Israel since suffering heavy losses during an Israeli military offensive in Gaza three years ago. The group does not want to provoke another round of heavy fighting, though it has done little to stop militants from smaller groups from firing rockets and mortars into Israel. Hezbollah has been less clear on how it would respond to an Israeli strike on Iran. Last month, Hezbollah chief Hassan Nasrallah said Iran would not ask Hezbollah to retaliate. 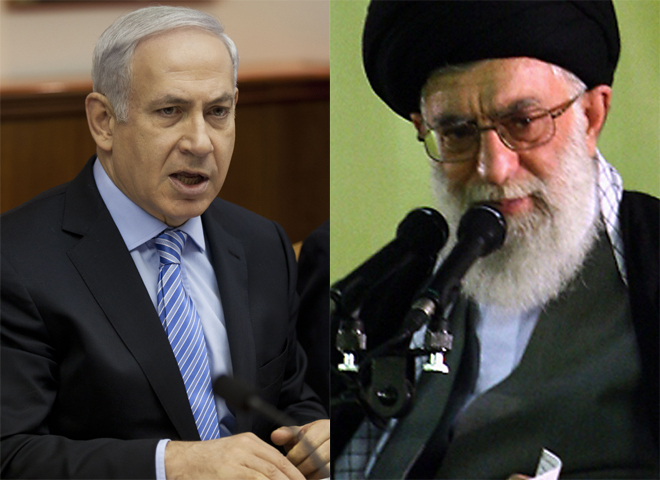 "There is speculation about what would happen if Israel bombed Iran's nuclear facilities," Nasrallah said at the time. "I tell you that the Iranian leadership will not ask Hezbollah to do anything. On that day, we will sit, think and decide what we will do." In 2006, Hezbollah and Israel fought a 34-day war that killed about 1,200 people in Lebanon and 160 in Israel. Hezbollah fired nearly 4,000 rockets at Israel. In Israel Wednesday, Netanyahu's national security adviser, Yaakov Amidror, welcomed an upcoming round of talks between six world powers and Iran over its suspect nuclear program. No date has been set. Amidror said Iran can be prodded into concessions only by the threat of military action, and that there is a chance the talks might fail. "Without a real military alternative, the Iranians will not make concessions in the talks," he said.